c/w Bender Ball, Instruction Flyer and 4 online videos. 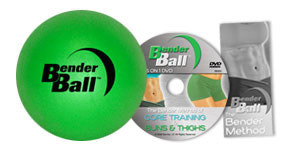 Take your workout to the next level with the Bender Ball Fit Kit! the Bender Ball allows you to work your core in ways you can't do with standard crunches or large exercise balls. The Bender Ball has been documented with the Journal of Applied Research and studies have shown that by utilizing the Bender Ball it will generate 4 times the workout in an abdominal crunch per each second of exercise. This unique workout incorporates Leslee's Selective Stabilization method to bring you the best possible results. Experience the Bender Ball for yourself and see why it truly is "The Little Ball That Does It All"!